Company on the way? Follow these tips for treating your guests to a thoughtful stay. 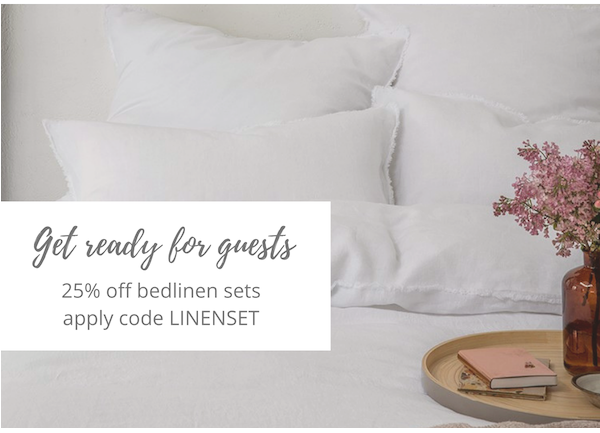 The slightly crumpled look of linen creates a relaxed feel for your guest bedroom, as far away from a pristinely pressed sheets as you can imagine, but no less luxurious. Linen sheets are naturally breathable, which helps when you don't know your visitors temperature preferences for the room. They’re also well worth considering if you or your family suffer from allergens or skin problems, as pure linen sheets boast anti-allergic and ecological properties. Aside from the obvious visual appeal, linen sheets are also extremely low maintenance. You can leave the iron in the cupboard as these bed sets are designed to look best when left to dry naturally. Really, is there any wonder our linens are gaining even more popularity? When it comes to bedtime, nothing beats the feeling of cocooning under a cosy duvet. Our collection of natural and hypo-allergenic duvets promise to deliver the perfect temperature. Internal box constructions provide even warmth and a row of buttons means most can be joined to a second duvet during those extra cold Winter days. For the softest surface possible, they are encased in high-grade cotton, which prevents the filling from escaping. We finish all our natural feather filled products with a 10-year guarantee. A couple of extra cushions and throws will instantly add warmth. Our Jacquard throw look absolutely wonderful layered with our Pale Grey Fringe Throw at the edge of the bed. You can also personalise our mini cushions for only £8. Make sure the room also includes cosy finishing touches to really make the space stand out. Once the main aspects of guests staying have been taken care of, you can look to those small little luxuries which will make the experience even more special. Simple bath robes and a laundry bag will give your guest room a luxurious hotel feel, as well as other cosy finishing touches to really make the space stand out. If there is one product that truly showcases linen at its finest, it is our humble waffle towel. The hollow fibres of 100% linen make it far more absorbent than cotton, resulting in considerable smaller towels that dry faster and take up less valuable space in your washing machine. Perfect for when you have visitors to stay. Our Fringe Hand Towel will look elegant in a guest bathroom and you can spray all these linens with fresh and natural linen water. A bedside table lighting for reading, a carafe with water along with a glass, a full-length mirror, a clock, a closet and drawer space, set out toiletries, and write down your wireless internet password on a notecard. Foil-wrapped chocolates, an universal charger, a few cut blooms in a vase and a curated selection of books. If space allows you could also add a comfortable armchair or a desk, and a basic tea and coffee making facilities on a tray so your guests can enjoy their morning beverage from the comfort of their room whilst also giving you a few precious more minutes peace before you start preparing breakfast.